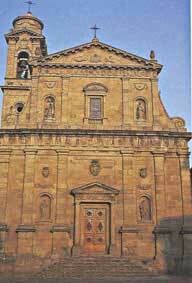 Dedicated to the nativity of the Virgin Mary, is the largest religious building of the Amiata region. The facade with its strong baroque characteristics (XVIII° century) is in local stone. In the triangular tracery above the entrance, the portrayals of God and two angels have been sculptured. In the four niches of the facade there are the statues of Saint Peter, Paul, Nicola di Bari and Vincenzo Ferreri, while the portal is dominated by the Medici coat of arms. Inside, there are several paintings by Nasini (S. Caterina, d'Alessandria, the Nativity of the Virgin Mary and the Deposition by G.N. Nasini; The Virgin between Saints Niccolò and Michael By Francesco Nasini). By Sorbelli, there are The Oration in the garden and The Stigmatization of Saint Francis. The niches hold statues of Saint Sebastian and Saint Rocco.